Dying in his fireman's arms, the engineer's final words were, "Tell my wife I died thinking of her." While typically devoid of details, the folk tale is nonetheless true. It might have been lost forever to history, if it weren't for a cryptic monument and a tourist's curiosity. 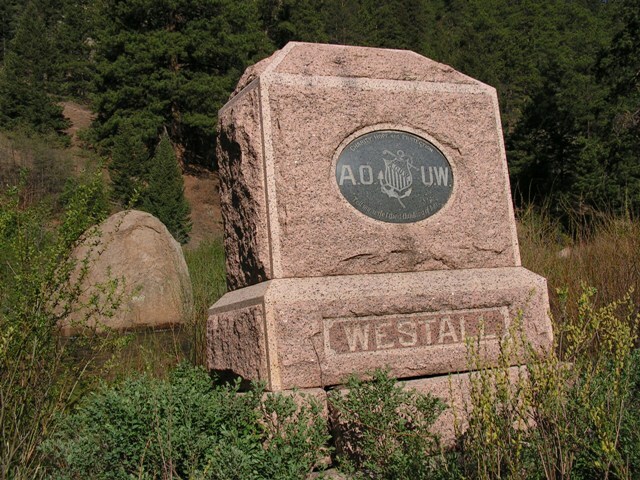 The full story of the monument, the tourist and the engineer who saved 450 passengers from death is recorded by Milly Roeder in an article, The Story of Billy Westall and the Westall Monument, originally published in 1998 by the Jefferson County Historical Commission. The next year after Westall's death, the DSP&P was absorbed in the 1899 merger creating the Colorado & Southern. That same year, the monument was placed along the right of way near the spot of the derailed engine. For the next century, it stood, surviving not only the C&S, but the Burlington, BN and all the people who ever knew Westall. The monument itself, according to the 14 year-old article, was in peril of falling into the river. Enter a group of students, the National Junior Honor Society from West Jefferson Middle School in Conifer. Over the past year and a half, they've been planning and working to restore the monument. Notably, the way they're going about it seems to be working. They've involved a number of folks, like Denver Water's Neil Sperandeo, and historic groups, including Colorado Preservation Inc. and the Denver South Park & Pacific Historic Society. As of this month, work has progressed to the point that they have a new site picked out and could use some grant money to restore the monument to its new location. Those interested in getting involved or donating to the project should e-mail Mr. Frank Reetz of West Jefferson Middle School.